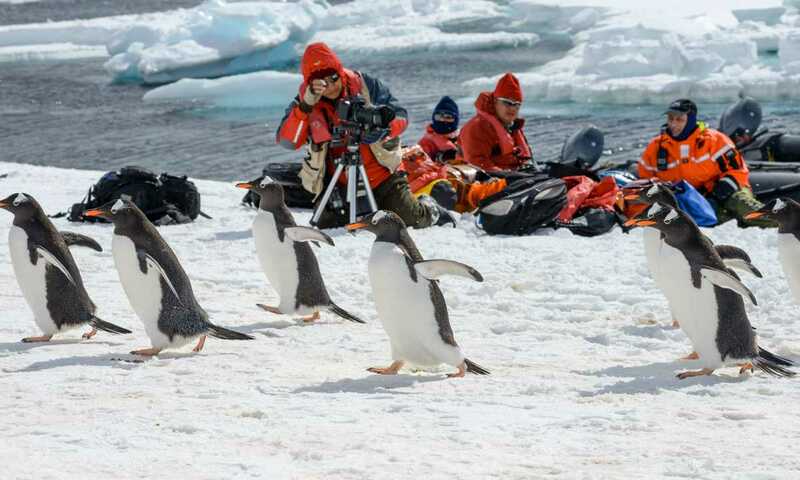 Why not tell the story of your amazing Antarctic experiences through pictures? Be amongst other keen photographers and feed off the expertise from a strong team of on-board professionals. Antarctica is a fascinating and magical place, and these cruises are all geared towards offering you the best experiences for your personal interests. It is said that a picture is worth a thousand words. 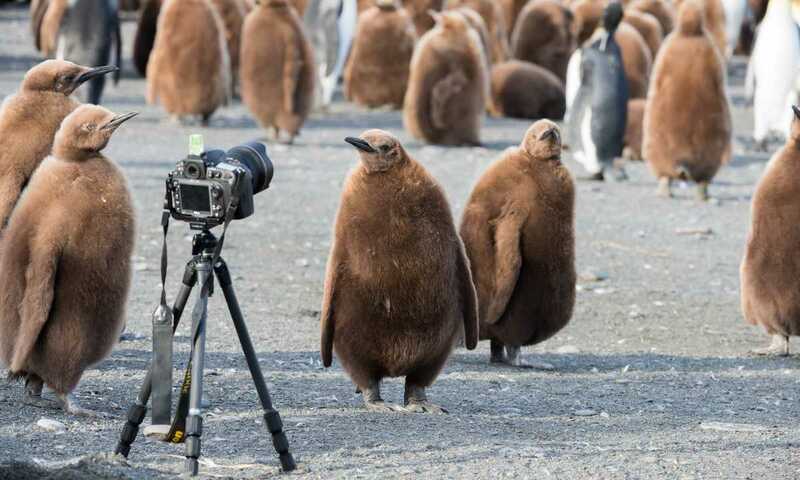 This is certainly the case with anything that you photograph in Antarctica, with its fascinating wildlife and breathtaking landscapes. Looming snow-capped mountains and shimmering blue and green glaciers form a spectacular backdrop for the incredible array of wildlife you'll find on the white continent. Along with a unique variety of sea birds, you will spot seals lounging on ice floes, catch glimpses of whales, and find many of the penguin colonies that have made their home on the coastal shores. Unique locations: South Georgia, with its rich and fascinating human history, is home to 200,000 pairs of King penguins, thousands of elephant and fur seals, and the wandering albatross. The Falkland Islands are known to be a paradise for photographers and birdwatchers, with its 60 breeding pairs of Antarctic bird species. Photography Workshops: On these specific photography voyages, there will be a strong team of expert photographers onboard, keen to share their photography tips and knowledge of the natural history of the area. Excursions: Landings and zodiac excursions will be made according to wildlife in that area, daylight and accessibility. The Antarctic summer (December to March) means longer and longer hours of daylight. There will be days of continuous, 24-hour daylight. Penguins are the ultimate emblem of Antarctica - what better way to spend your Antarctic cruise than on the ice, amongst these comical creatures? Zodiac excursions on these wildlife cruises allow you to get up close and personal with these fascinating, and very vocal Antarctic mammals. There are 7 different Antarctic penguin species, but only two really live and nest on the continent itself. Emperor penguins live on the continent, and at about 115 cm tall, are the tallest of all the penguin species. Together with the emperors, Adelie penguins are the second most southerly of all penguins species. It is estimated that there are 2.5 million breeding pairs. Most Gentoo penguin colonies can be found along the Antarctic Peninsula, though are also known to be the most northerly of the four species nesting on the continent itself, with some of its colonies on the Falkland Islands. Some Chinstrap penguins do nest on the continent, though they prefer the slightly warmer waters of the islands off the Antarctic Peninsula. One of the largest colonies of Chinstraps can be found on Deception Island, where you'll find possibly over 1 million of this species. Of the other 3 species that prefer the warmer waters of the sub-Antarctic islands, the King penguin is the most northerly. Averaging at 95 cm, these penguins are the second tallest of all the Antarctic penguins, easily identified by the striking orange-gold feathers on their neck. Macaroni penguins got their name for their tufty orange eyebrows (similar to the macaroni fashion of the 18th century). There are an estimated 12 million breeding pairs, mainly found in South Georgia, nesting in their hundreds and thousands on rocky cliffs and hillsides. The smallest of all the penguin species and with thin, yellow feather plumes, Rockhopper penguins can be found on the Falkland Islands or on sub-Antarctic islands north of the Antarctic Convergence. There are thought to be around 1.8 million breeding pairs, though this is a species massively in decline. Whales are definitely amongst some of the most magnificent mammals in the world. The whales found in Antarctic waters migrate long distances, heading to warmer waters during the Antarctic winter (June-August) and returning in the austral spring. Due to the receding ice edge in these warmer months, the Southern Oceans become a rich feeding ground for the whales. Whale calves are born in these more hospitable seas as they would struggle to survive in the colder Polar waters. At 150-200 tonnes, the Blue whale is the largest, not only of all the whales, but of all animals ever to have lived (including dinosaurs)! The Fin whale is the second largest, most common and fastest of all the large whales. Southern Right whales are slow-swimming, easy-going mammals, often found near the shore. Only male Sperm whales are found in Antarctic waters. These whales are the deepest divers of all species, catching the giant squids that live in the darkest depths of the oceans. Amongst the larger whales, Sei whales are the species you're least likely to spot. They don't come very close to land or travel in groups. Out of all the large whales, the Humpback whale is probably the best known. They travel slowly and in groups, drawing attention to themselves by breaching or lob-tailing. Minke whales are one of the smaller whale species, with the average adult growing to 9m long. Killer whales (orcas) are commonly known as the 'sea-wolves', as they hunt down, in their packs, anything from krill and fish, to penguins, seals and even other larger baleen whales. Antarctic seals will often be seen lounging on large ice floes as you pass them in your cruise ship or zodiac boat. Although they are primarily marine mammals, they all leave the water to breed, rest and molt. Ross and leopard seals are more solitary, tending to stick to the heavier pack ice, where few cruises pass. They are the largest of the Antarctic seals, with a female ross seal reaching over 3 metres in length. Crabeater seals live on the edge of pack ice and form small family groups during breeding season. Despite their name, they mainly eat krill. This species, with estimates at 30 million, accounts for more than half of the world's seal population. Weddell seals are probably the ones that you're most likely to spot. They tend to be found on inland ice around the continent, in groups of up to several hundred Weddells! This species feed mainly on fish, and can dive to extraordinary depths to find their food. Elephant seals are most commonly found on the sub-Antarctic islands. They grow extremely large, with males measuring up to 4.5m, and have to dive deep in order to satisfy their massive appetites with large fish and squid. Unlike other Antarctic seals, fur seals form part of the eared seal family. They have known to be extremely unfriendly with humans, moving fast enough to outrun them. Their breeding season starts around December-time in very dense colonies, and their population doubles every 5 years on South Georgia island - a species to watch out for, in more ways than one! Antarctica is home to a stunning and unique array of seabirds. 35 different species live south of the Antarctic Convergence, though only 19 breed on the White Continent itself. There are probably 100 million or more that breed along the coast and on the offshore islands of Antarctica. Just to list a few, you may well find various species of comorants, skuas, shags and petrels. Most of these birds breed in large concentrations and during the austral summer, when there is plenty of plankton and fish for the chicks to feed on. At some point on your cruise, if you look to the skies, you are likely to find the wandering albatross. With a wingspan exceeding 4m, the albatross is one of the great wonders of Antarctica, made even more mystical by its association with Coleridge's poem 'The Rime of the Ancient Mariner'.